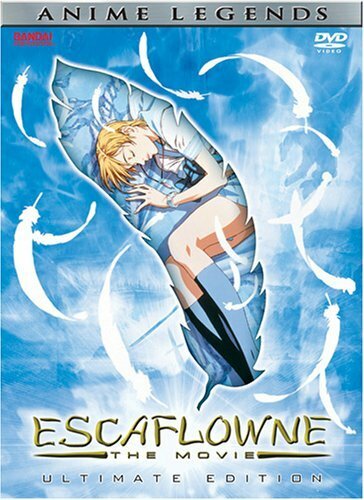 Escaflowne: The Movie is an Alternate retelling of the Escaflowne series. In this movie version, Hitomi Kanzaki is a depressed teenager, detached from other people and life itself. She goes on believing that she should just fade away. However, her depression and misery summons Lord Folken, and whisks her away to the world of Gaea. Gaea is a world hidden behind Earth's moon, and is in the middle of an ongoing war against Folken's forces. Many of the inhabitants believe that Hitomi is the Wing Goddess (capable of bringing out the legendary Dragon Armor called Escaflowne). She is also prophesized to bring about an ultimate outcome to the war and the very fate of Gaea itself. Hitomi meets a warrior named Van who fights to get revenge on Folken for the destruction of his Kingdom. Hitomi joins Van and his companions on a quest to battle Folken and help Hitomi fulfill her destiny as the Wing Goddess.